Just as Father Jacques Marquette and Louis Joliet had traveled in 1673 to many regions of the southern United States, they had also been through the Missouri area. By April 9, 1682, the French explorer Robert Cavalier, Sieur de La Salle took possession of the Louisiana Territory area for France of which Missouri was included. Over the next few years several settlements are attempted, but fail due to the living condition, usually swamp lands. In 1714, Etienne de Bourgmont finally manages to build and keep a fort for a number of years on the Missouri River near the mouth of the Grand River. In 1724, Fort Orleans was next built by de Bourgmont, but only last six years. St. Genevieve was established as a trading post, the first permanent white settlement. The City of St. Louis further up the Mississippi River was founded by Pierre Laclede Liguest and Rene August Chouteau by 1764. 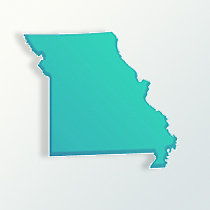 In 1770, Spain now has control of the area of Missouri. Into the 1790s additional new towns were started along the river, including New Madrid. Then, in 1800, Spain returned the Louisiana territory to France and France sold it to the United States in 1803. Expansion was underway by 1808, with the Missouri Fur Company organized in St. Louis. The abundance of animal pelts in the Mississippi Valley region played a key role in the development of the Upper Louisiana territory. In 1812, the Missouri Territory was created and stream boat traffic increased along the Mississippi River. One of the religious groups emigrating into Missouri were the Mormons. By 1838, due to internal conflicts with the state’s citizens and the Mormons, the “Extermination Order” against Mormons living in Missouri, was issued demanding that members of the Mormon church leave the state. There had been also more free African-Americans coming to Missouri and by 1842, Missouri then banned free blacks from settling in the state. In 1849, Missouri towns of St. Louis, Independence, Westport, and St. Joseph had become points of departure for emigrants headed for California. Missouri was the “Gateway to the West” with the discovery of gold in California. The Pony Express started its first run from St. Joseph, Missouri to Sacramento, California in April 1860. Missouri was a border state and very divided during the American Civil War. Many of the Irish and German immigrants arriving in the late 1840s and 1850s fully understood famine, oppression and revolutionary upheaval. These newcomers to Missouri quickly expressed how they were unsympathetic to slavery. In January 1865, Missouri abolished slavery by an ordinance of immediate emancipation, making Missouri the first slave state to emancipate its slaves. Woman’s Suffrage got started and organized in Missouri in 1867. With the railroad system going through the state, the economic basis expanded for Missouri. This also opened new lands for settlement by Germans who were arriving in large numbers. They helped develop small diversified industries within the cities. Later Czechs and Italians immigrated to the state. In looking at Missouri genealogy, it is seen that by the late 1800s most of the Native Indians had been moved out of the area or died. No Indian reservations were established for the few remaining. The City of St. Louis has remained the center of the African-American population. Most of the ethnic background for citizens of Missouri today is that of German, then Irish and English. The population changed from 1.2 million in 1860 to 3.1 million in 1900 to 6 million citizens in 2009. Roughly 87 percent of the population today is of European descent. There are 12 percent of African-American heritage and 2.5 of Hispanic background. A small group of Missouri Creoles south of St. Louis represents about 3.5 percent of the French ancestry.